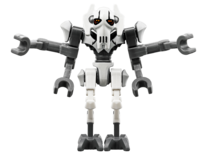 General Grievous is a Star Wars minifigure based on the character of the same name. 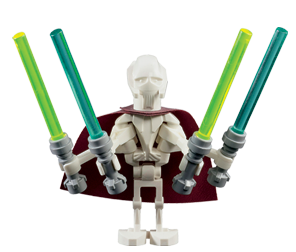 Grievous has currently appeared in three sets with two different variations, and will be released in a fourth in 2014. Grievous is a major character in the Star Wars theme, appearing in Star Wars: The Revenge of the Sith and the Clone Wars sub-theme. 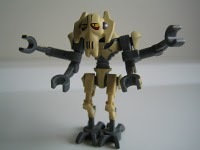 The minifigure has a styled head, body, four droid arms and a set of droid legs; the latter two were parts identical in design to Battle Droid parts, with a white colour instead of tan. 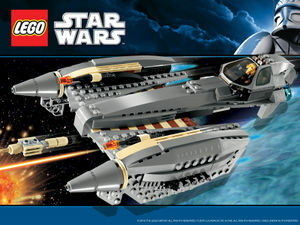 However, in 8095 General Grievous' Starfighter, LEGO altered the design so that Grievous resembles his appearance in the series, giving him a neck that extends horizontally from his body, and a new, less mechanical-looking body. The head is new, and has paint applications to the face and eyes. 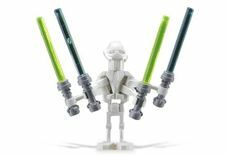 Grievous is also given new legs and arms, and his decoration is somewhat peach-coloured. 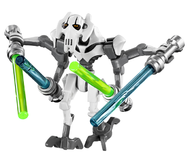 Grievous had four lightsabers in both sets that included the General's initial incarnation (two green, two blue), and in 7656 General Grievous' Starfighter, and also came with a gun. 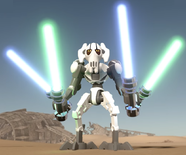 Grievous even has his own droid bodyguards, also known as MagnaGuards, which appear in the sets 7673 MagnaGuard Starfighter and 7752 Count Dooku's Solar Sailer. A two-part video on the LEGO Star Wars website named The Quest for R2-D2 shows a slight variation of the old General Grievous figure, including black arm and leg joints, a redesigned cape from 7255 General Grievous Chase, and a slightly yellow-tan tinge to his armour. The colouration for his armour carried on to the Clone Wars line. Born Qymaen Jai Sheelal, Grievous was once a Kaleesh warrior who was engineered for Count Dooku's purposes before the Battle of Geonosis, in preparation of the Clone Wars. Before his transformation into a cyborg, Dooku had Grievous's shuttle crash, leaving him barely alive with near-fatal injuries. Count Dooku then offered him a new existence and he was transformed. 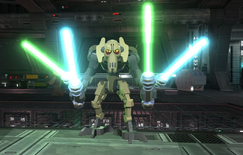 Grievous then took up the position as General of the Confederate droid army, and was trained by Dooku himself in the seven classic forms of lightsaber dueling. He usually collected the lightsabers of the Jedi he killed as trophies, as he had a great hatred for Jedi. Before the events that occurred in Star Wars Episode III: Revenge of the Sith, Grievous, in his final major act, infiltrated the Senate building and captured Chancellor Palpatine, taking him prisoner aboard his flagship, the Invisible Hand. In the opening events of Episode III, Jedi Knights Obi-Wan Kenobi and Anakin Skywalker sucessfully rescued the Chancellor from Grievous' hands, and the cowardly General fled from his dying flagship to the world of Utapau. Obi-Wan pursued him to Utapau and confronted Grievous. 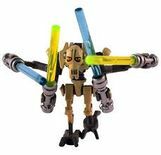 Ordering his army of droids to stand down, Grievous challenged the Jedi Knight for a duel to the death. 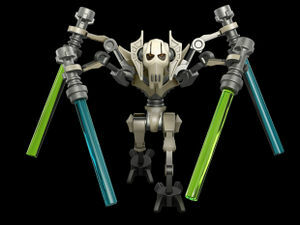 Grievous utilised all four of his arms, and first attacked using his lightsaber-buzzsaw technique. Obi-Wan was able to survive this attack, and sliced the hands from Grievous' lower arms. Grievous then fled in his personal wheelbike. Kenobi chased him through the city streets on the back of a varactyl, a Utapaun lizard, before finally engaging him again on a landing platform. Obi-Wan was able to disarm Grievous, but the general used his cybernetic implants to pummel him. Kenobi was able to pull apart a section of his armour, revealing his internal organs. Obi-Wan tried to trip him, but the metal was too hard for his leg, and Grievous threw him to the edge of the platform. As Grievous was about to strike Obi-Wan with the electrostaff, Obi-Wan used the Force to summon the blaster towards him. He then killed the general by firing multiple blaster shots into his now-exposed internal organs, igniting the flammable liquids and causing him to explode. His armoured shell remained untouched while Obi-Wan stole his starfighter. After the Clone Wars, his body and a few of his IG-100 Magnaguards were salvaged by Stormtroopers and sat in an Imperial warehouse for eleven years, until discovered and rebuilt by the Imperial scientists Dr Nycolai Kinesworthy and Truen Lorn. The reborn general lived briefly until being disassembled by an unknown group of spacers during a raid. Grievous appeared in LEGO Star Wars: The Video Game and LEGO Star Wars: The Complete Saga, both appearances based upon his original variant. Instead of dying after being shot several times in the chest by his own blaster, he died after he was shot once by Commander Cody's gun, after killing him, and his head came off. 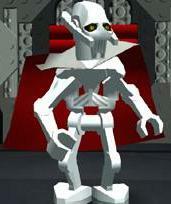 His in-game appearance has non-LEGO eyes and skin that can be seen up close in a cut-scene, leaving only his droid and armour parts with a typically LEGO appearance. His cape is also dual coloured. He has an appearance in LEGO Star Wars III: The Clone Wars, based upon his redesigned minifigure. This page was last edited on 30 December 2017, at 08:45.